Spend time with God through enriching daily devotion. If you’ve longed to spend time in prayer and God’s word but need a plan of action, Reflections Devotional Guide can help. Offering 128 pages of thoughtful, daily devotions, Reflections is designed to challenge and encourage adults on their spiritual journey. Reflections follows the Narrative Lectionary, a popular alternative cycle of Scripture readings to the Revised Common Lectionary. Learn more about the Narrative Lectionary from Working Preacher here. Reflections can become a vital part of your extended church ministries. Visitors and new members. College students. Nursing homes. Military. Prisons. Long- and short-term missions. 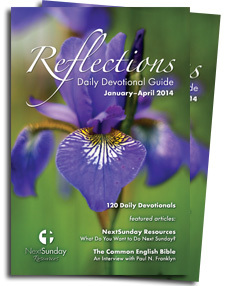 Attach a sticker from your church to each copy of Reflections and remind them of your care with each day’s devotion. We understand good stewardship of dollars. Reflections is priced at or below the competition. Plus, our publishing schedule (trimesters instead of quarters) saves you money on shipping. Want to go green? Reflections Digital Devotions is available as an eBook! Reflections is now available for your digital reader!